House decoration seems to be a constant work in progress. No matter how much time you put in finding the perfect design solution for each living space in your home, there always seems to be room for improvement. When redecorating, or purchasing new stuff for our home, we always tend to focus on the living room, kitchen and the bathroom first – and the bedroom often gets left behind. After all, most of us only sleep in it and use the rest of the house for the rest of the day, so at a first glance, spending too much time in bedroom decoration seems like a waste of effort. On the other hand, we’re constantly bombarded by new reports coming in every couple of months, that only confirm the importance of quality sleep for overall health, happiness, hormonal balance, and even weight loss! Aside from room temperature and comfiness of your mattress, having a good bedroom lighting design can make or break your sleep. Lying in darkness will send signals to your brain that it’s time to unwind and go to sleep. The problem is, most of us have a bedside lamp that, more often than not, has lighting that is too aggressive for taking your body into relax-mode. When it comes to your bedroom, dimmable and smart lights are the best option, because they are adjustable and softer than regular lights. Having said that, there are a few reasons why having LED lights is a better option, not just for your bedroom, but for your entire house. They are extremely energy efficient, which means that not only is that the step in the right direction to going green, but your electricity bills will be lower as well. As an addition to this advantage, an average LED light bulb will last you a while – 1.041 days or close to 3 years, to be exact. If you compare that to the regular halogen light bulb with an average light span of 83 days, it’s clear that with the LED light you won’t spend nearly as much money on light bulb replacements. There are different tones you can get with LED lights. They can be cool light, daylight, warm white and very warm white. The cool-toned LED lights have a refreshing awakening effect, so they’re best placed in your bathroom, for example. 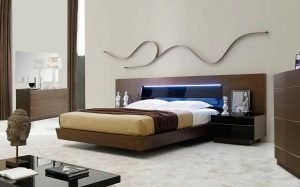 The best-LED lights for the bedroom are the warm-toned ones because they are the most pleasant to the eyes and are able to create a relaxing ambiance. They can give off tones that range from light yellow to deep red, thus creating a warm and inviting atmosphere for your bedroom. 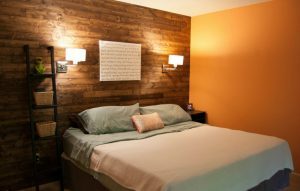 Depending on your personal preference, the design of your bedroom lighting can range from contemporary to modern industrial, to even a rustic-feeling light placement. Whatever your choice may be, the old one-chandelier-two-bedside-lamps approach is taking a back seat to fresh new design ideas. LED bedroom ceiling lights are as versatile as they can be! One of the classics LED light choices is the indirect lighting, which emanates from your ceiling, but is never overwhelming for the eyes. This is ideal for people who have a habit of waking up during the night to go to the bathroom, because the indirect light is mild enough that it won’t interrupt your sleep, and yet it will give you a much-needed sense of direction when you wake up groggy to stumble to the bathroom. Another popular and a bit less modern option is to create a romantic bedroom atmosphere with a ceiling decorated with a string of warm-toned soft fairy lights. While it can be a daring choice to make, keep in mind that the bedroom is yours and yours alone, your guests won’t come in it, so if you like a design solution, this is the right place to go ahead and implement it. This type of design is one of the cheapest ways to transform your bedroom in no time. If you were a fan of stars on the ceiling as a kid, there is a way to achieve a more grown-up and sophisticated version of that look. Just install dozens of tiny LED dimmable lights on your ceiling, without any particular order. When you turn off all the other lights, they will resemble the night sky while providing just enough light so you’re not in the total dark. This technique is really hard to resist! For those with a bold sense of style, you can try adding LED lights under your bed – it will create a unique twist and accentuate the bed, that’s going to look like a cloud hovering above your floor. Painting your bedroom walls in dark colors can be exciting! Surprisingly, it gives a serene and clean effect, rather than looking dim and depressing. However, if you ever wish to break the monotony with some LED lights, opting for a string of light above the headboard can make your bedroom into a magazine-worthy space! Naturally, your bedroom decorations don’t have to revolve solely around the bed – you can achieve a great visual effect by decorating your vanity or shelves with LED lights as well. We would advise picking one bedroom object to accentuate and not go overboard, but with such great options, we wouldn’t blame you if you went a little crazy. Don’t underestimate the visual power of a good bedside lamp. Our personal favorites are minimalistic brass lamps – they never fail to look elegant. Now that we went through some bedroom decorating options, there’s one more thing to consider when buying your LED lights. Since you don’t want your bedroom to look like a nightclub, it’s best to invest in dimmable bulbs – they will allow you to rest after a hard day’s work, but they’re also versatile enough to provide sufficient lighting if you like to read in bed. Another reason to consider LED lights in the bedroom is that they can operate on extremely low brightness levels, which can prove to be a godsend if you have a little one that’s afraid of the dark! We hope you liked our suggestions to make your bedroom a warmer and more stylish space. Happy decorating! How lighting affects our mood? Previous story How Does a Solar Pump Work?